Although Caen is literally just across the water from Brighton – set off swimming due South from the end of the Pier and you’ll end up thereabouts – it’s a bit of a mission to get to. Last year the team opted for the Dover-Calais ferry, misjudging quite how far they’d have to travel on the other side. The most direct route involves getting a ferry from Portsmouth to Caen itself, although the ferry port is actually around 10 miles away in Ouistreham. Last year BRATS opted for the Newhaven-Dieppe ferry, which is super cheap (£30 return for a foot passenger) but then involves a 2.5 hour train journey (£30 each way) on the other side. The SNCF timetable says change at Rouen, but it’s usually the same train for both stages of the journey. Hotels in Caen are pretty cheap in the winter if anyone reading this fancies a last minute trip. The venue is the Halle Aux Granges, a chilly sports hall close to the Abbey in the West of the city centre. Tickets are 10 Euro for the whole weekend, free for under-12s, and available on the door. Brighton have two games on Saturday (against hosts Caen at noon and Amsterdam at 4pm local time) plus a game on Sunday whose opponents and timeslot depend on how they did the previous day. Last year’s Sunday night after party was pretty spectacular, and this year’s is in the same small bar (Au Chef Raide) close to Saint Pierre church in the centre of town. Sadly, circumstances mean BRATS can’t make this year’s event, but we are hoping someone there will be able to provide this site with a tournament report. [If you don’t like predictions, skip this paragraph.] Flattrackstats.com have Brighton as by some way the lowest ranked team in Pool 2, placing 88th in Europe on 567.1 points. Hosts Roller Derby Caen (44th, 619.8) are given 86% chance of victory with a 42:23 differential suggesting they’ll beat the Rockers by about ten points more than last year’s 236-145. Amsterdam are ranked 40th (623.3) and – allowing for a neutral venue – have around 84% chance of victory with a 15:9 ratio suggesting something similar to the Caen result over Brighton. In Sunday’s playoffs the Rockers will play whichever Pool 1 team finished in the same place (1st, 2nd or 3rd) in the table that they did. Whether it’s Nottingham’s Hellfire Harlots (27th, 661.6), Helsinki’s Kallio B-team (35th, 632.8) or Roller Derby Madrid (60th, 599.9), Brighton will be facing a much higher ranked team for sure. Anything better than last year’s last place finish will be an awesome result for the Sussex side. Hi. The Rockers are kicking off their 2017 season the same way you began your 2016 one – by playing in the Slip It! tournament in Normandy. What are your recollections of last year’s tournie? Apart from the twelve hours of driving it was a lot of fun! It was the first real tournament we had played (aside from the Alexandra Palace one dayer in 2013, which most of the current team didn’t play in) and really showed us the different styles of derby from around Europe. We had previously been playing a lot of more local teams who have similar styles, so the variation in Normandy made us learn to adapt to the games there fast. It was also quite intense playing games so close together. Caen are amazing hosts – that after party…! Last year you took a fairly mixed squad, with quite a few prominent A-teamers missing and some players making their AllStars debuts. Will it be similar this time? Who should people look out for in the Rockers ranks? Again we are coming with a small but mighty squad. Notably we’re missing Gin (obvs) but also Cake Or Death and Dr Whooligan. However we have brought up a couple of newer players who are handling it amazingly, such as Farmergeddon and Harriet Hotter, and I can’t wait to play with them on track. We only have thirteen players instead of a full squad of twenty, but it’s quality not quantity, right? Plus we have Finn – who could want more! 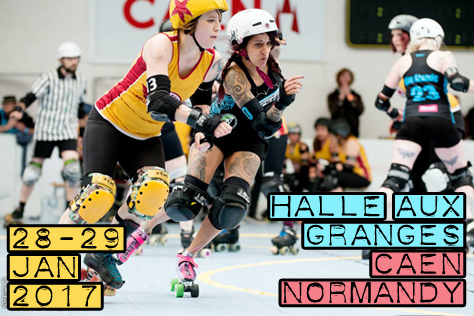 Your first game this Saturday is against hosts Roller Derby Caen. You lost 236-145 to them last year. What do you recall of that game and will you being doing anything different this time? They are super solid and are a small league that play with a great hive mind. Their jammers are all smart, fast and strong. I remember being stuck in the bosom of Quinn Cardinal quite a lot. She is a one woman blocking machine! Your other group game is against Amsterdam Roller Derby. Do you know much/anything about that team at all? What are your expectations for the game? I’ve been wanting to play Amsterdam for AGES! It’s really hard to find any info on teams these days, and I’d rather not go looking too hard as you end up in that dangerous position of trying to play their game not yours. Our aim is to just adapt as we go. We have really mixed our packs around this time for ultimate flexibility and being able to adjust easily. Depending on how you do on Saturday, you’ll face one of the following in Sunday’s play-offs: Roller Derby Madrid, Nottingham’s Hellfire Harlots, or the B-team of Kallio Rolling Rainbow (Helsinki). What do you know of those sides? Do you have one in particular you’d like to play against? All of them! I’m so excited about the other teams, and interested to see how they cope in a tournament situation too. Never underestimate anyone. Kallio are obviously going to be strong as their A-team are incredible, but we have a couple of bits of Finland on our side too, shhhh! Last year you finished sixth out of six – what are you hoping for this time around? Presumably you enjoyed the experience as you’re heading back. What are the benefits of playing in a tournament like Slip It! for the Rockers? And are you expecting another messy after party? We want to learn. After last year we decided that our goal was to play more European teams, which we did, and I feel that really upped our game. I think our only weakness will be playing short, but we have a secret weapon (one loud blue-haired Canadian). It’s not about winning or losing as much as having fun and fulfilling our own personal goals. We also made some great friends last year, Eindhoven being our new BFFs. We’re going into this with great attitudes. And the knowledge that come what may, we are SMASHING that after party! Finally, you’re playing against Vienna in Haywards Heath on March 4th. Any thoughts looking ahead to that game – and to 2017 in general? The tournament is going to be a great warm-up for Vienna. We ended last year on a real high. I hope we can continue that into 2017. We also have some amazing players coming up, with our B-team becoming known for not only being the most fun to watch, but with some serious skill there too. Yeah it’s gonna be a good year all round!